The statistics above include the Clery Act crimes that occurred in 2015, 2016 and 2017 at on-campus locations, off-campus locations and public property adjacent to TCC campuses. 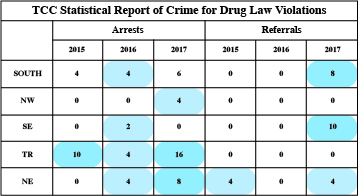 TCC saw an increase in drug-related arrests and referrals in 2017, according to the college’s annual security report released Sept. 21. Lt. David Herndon said he attributes the increase to a rise in the number of people involved in incidents compared to previous years when they saw more incidents with individual violators. “Referrals for drug law violations are based on the number of persons committing the violations in the reported incidents,” he said. Referrals for drug law violations are issued when someone isn’t arrested or doesn’t receive a citation for the violation, Herndon said. “It is a referral of any student or employee to a campus official who initiates a disciplinary action of which a record is kept or established and which may result in the imposition of a sanction by the institution,” he said. “In some of the cases, the evidence may not be sufficient for an arrest to be made,” he said, adding that in such instances when cases are reviewed by campus student support coordinators, who initiate disciplinary action for the district, offenders could receive referrals. Herndon also noted that the increase in drug-related offenses is not connected to the rise in opioid use affecting the nation. “Over the years, TCCD drug-related offenses have been and continue to be related to the use of and possession of marijuana on campus and other reportable locations,” he said. The TCC police department prepares its annual security report in compliance with the Jeanne Clery Disclosure of Campus Security Police and Crime Statistics Act enacted originally in 1990. “The original act was the result of a student who was slain in her dorm room in 1986, and in 1998 it was renamed in memory of the student,” Herndon said. The campus complies with the act by providing the Clery crime statistics for the past three years through an annual security report, issuing timely warning notices when a Clery crime occurs that presents a serious or ongoing threat to students and employees, and by sending emergency notifications to notify the campus community, he said. The purpose of it is to help prospective students and their parents as well as current students understand crimes happening on campus and in the surrounding areas of campus property. “Institutions need to provide information on the crimes so people can make better informed decisions about the safety of the institution,” Herndon said. Herndon attributed TCC’s comparatively low number of incidents to how vigilant campus officers are in patrolling campus areas as well as the college not being a residential campus. The report also includes institutional policies concerning campus security, the reporting of crimes, sexual assault and policies regarding alcohol, drug and tobacco use. To view the full report, visit TCC’s website. A printed copy can also be obtained by calling 817-515-5500 or by emailing maryjo.meloy@tccd.edu. “We encourage all students, faculty and staff to review the report for themselves,” he said. Previous articleEditorial – Who’s responsible for free speech online?